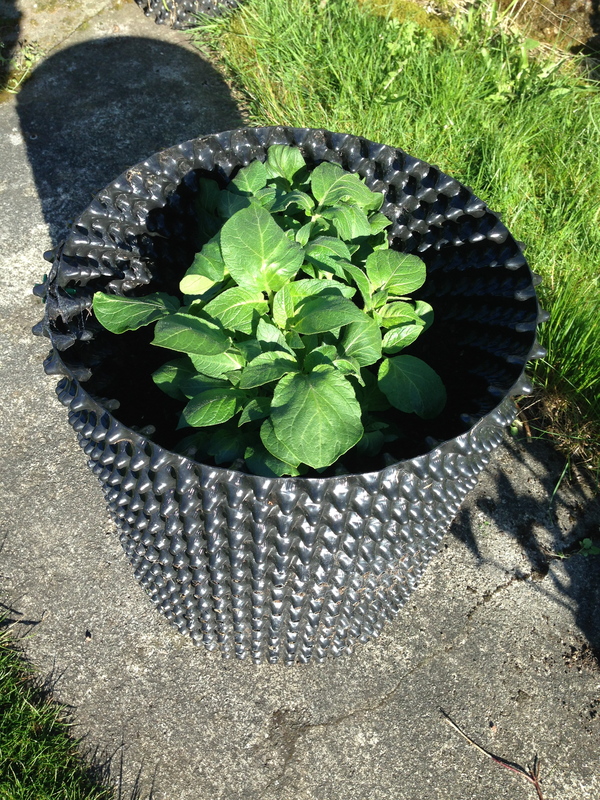 The weather has been cold this Spring, so crops in pots which can be given a bit of protection have a big head start on plants outside. 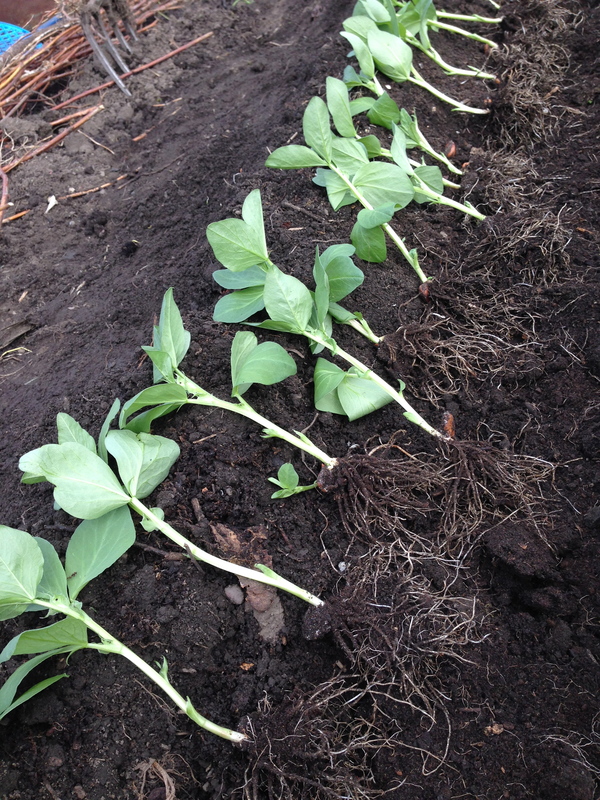 The broad beans sown in an Air-Pot tray and germinated in the heat, then kept in an unheated greenhouse have done well. The roots seemed nice and bushy when the young plants were transplanted, lots were poking out the bottom of the tray and were clearly air-pruned. Once they reached about 15cm in height they were teased apart and planted on the plot, I’m pretty sure beans sown in the cold wet ground would have rotted or been eaten by mice. The potatoes plants in an Air-Pot potato tower are showing above the soil and are now ready to be earthed-up. 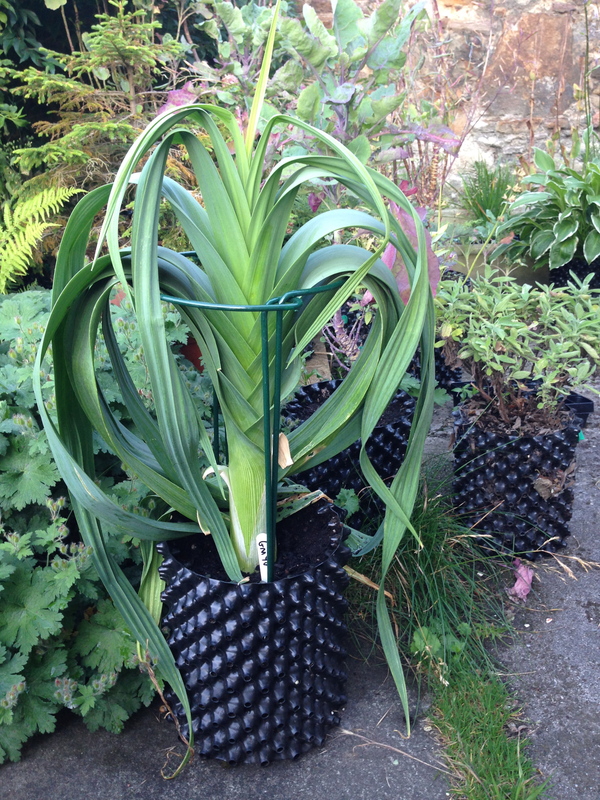 The pots were in an unheated greenhouse during the really cold weather but are now outside. The temperature overnight recently has been dropping down to 1 degree C, so the plants have had plastic bags over them, which seems to be stopping the shoots getting nipped by the cold. Indoors the chilli plants are a good height now and mostly starting to flower, so as soon as the weather warms up they will be ready to start fruiting through the summer in the greenhouse. The new year is still quiet on the growing front, mostly bare stems in the garden but even these can be attractive. 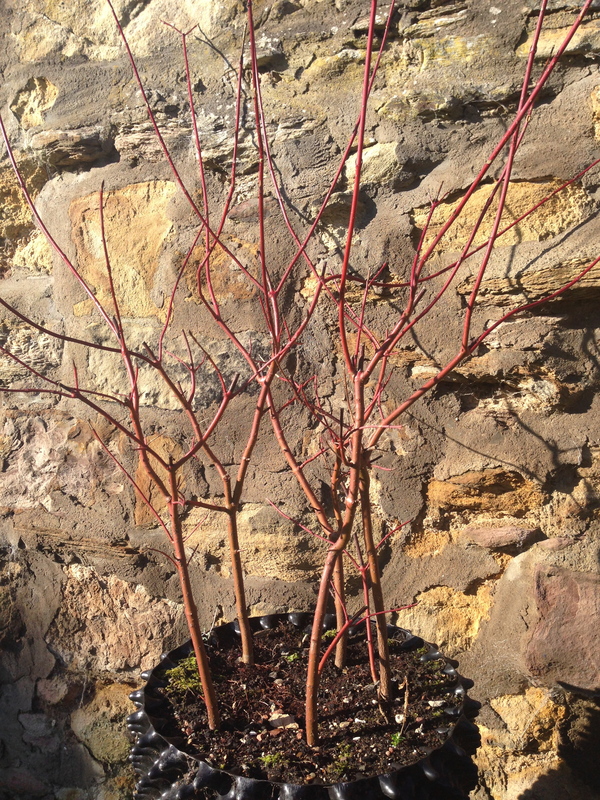 The red stems of dogwood bushes can look stunning when the winter sun hits them. They look better if most of the stems are reduced in length before buds break into leaf though, this encourages dense bushy growth over the summer and lots of new red stems to enjoy next winter. These prunings can be stuck into earth to root, I have had about five growing in a large Air-Pot container for a couple of years and they are getting quite well branched and bushy now, next winter when a few more stems have developed I expect quite a fiery display. I started some chilli plants at the end of last year and they are now going into 1 litre Air-Pot propagation pots, I am hoping these will be far enough advanced to use as display plants on Air-Pot stands at garden shows later in the year. Air-Pot is going to Chelsea Flower Show (22nd – 26th May) for the first time so some top class plants will be needed to dress the stand. If the young chilli plants are not ready I have managed to over-winter some of last year’s chilli plants. Pictured are a couple of Pimientos de Padrón, a little recently sown one and a survivor from last year which is already flowering, fingers crossed for some early pods. There has been a lot of house plant tending going on of late during the cold winter weather. 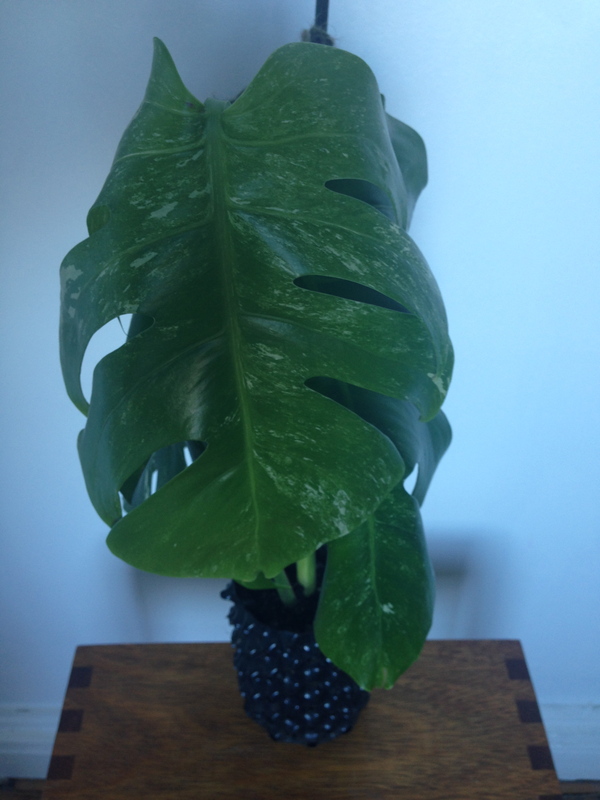 I was given a cutting of Monstera deliciosa (Swiss Cheese Plant) which I am trying to root. It is a variegated strain (actually more speckled) which means it is not as strong growing as the normal green type, it is planted in a little Air-Pot and is holding its own though looking a little droopy, I hope the aerated soil in the pot will be what it needs to get well rooted without rotting. it is touch and go at the moment, but I am really rooting for it (groan)! As this plant matures it will develop very thick aerial roots, which wave around looking for tree trunks to grab. Because of this unusual type of root I will be watching with interest to see how it grows in an Air-Pot. 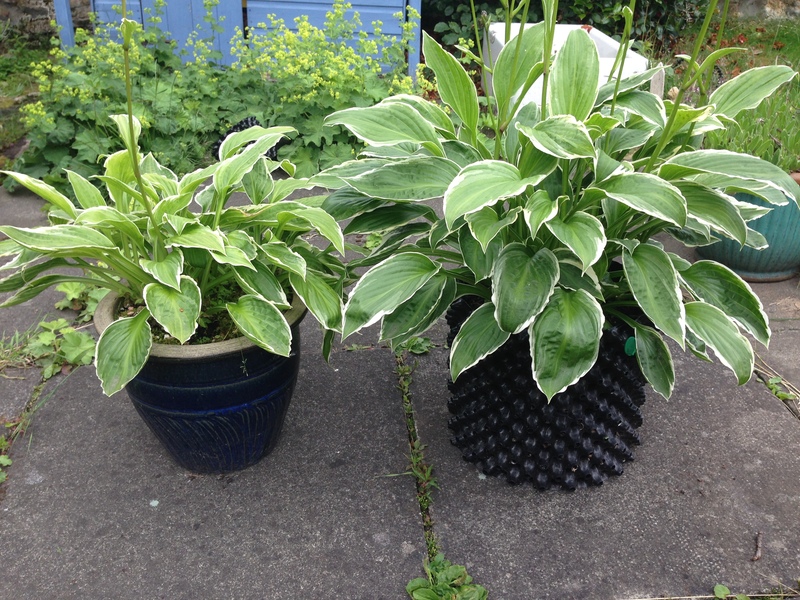 It is possible that air-pruning completely fails to occur and that roots simply thrust out through the holes in which case it will go into a normal pot. Autumnal abundance is very satisfying but when you cannot eat your pickings fast enough you need to put produce by for the winter. An easy option is to freeze crops but I have a small freezer and prefer not to rely entirely on the freezer. So bottled tomatoes and chilli jam are a store cupboard staple for me. 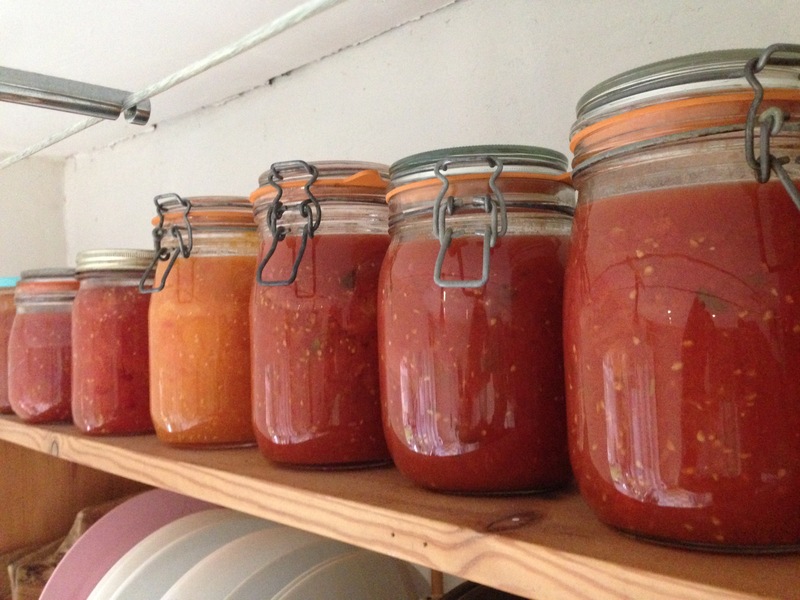 I have a collection of preserving jars which I use for tomatoes, mostly the clip top type, these are excellent as there is no need to tighten the lid on a hot jar as with the screw top jars, heated air just hisses out. 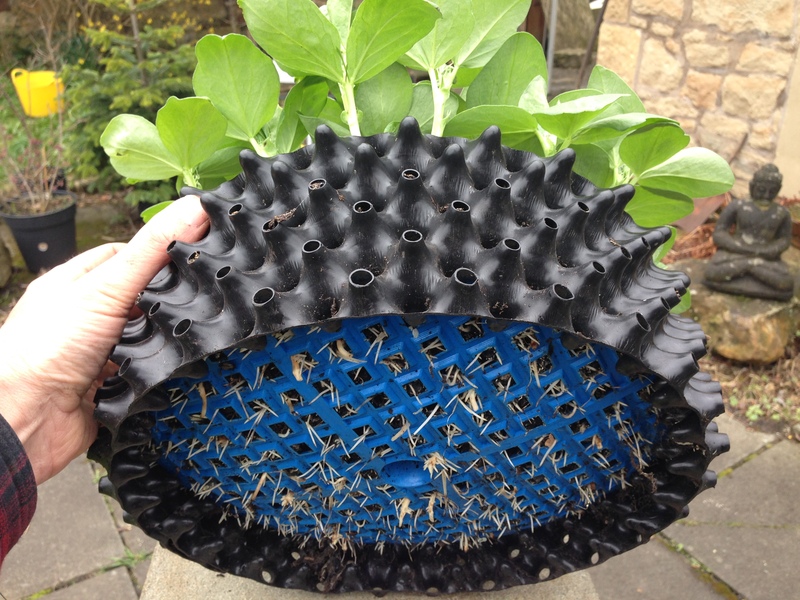 You do need to get hold of new rubber sealing rings if the existing ones looks at all worn, but a cheap rubber ring is a small price to pay for a litre or so lovely homegrown goodness ready to use in the middle of winter. My method is to peel and pack tomatoes into a clean jar pressing down so there is no air in the jar, or fill with a passata or sauce. I then put into an oven on the lowest setting for about an hour. When the contents are just showing a hint of bubbling it is hot enough and you can allow to cool, I have to nudge the setting of the oven up a tiny bit for 10-15 mins to reach the bubbling stage. Too hot too quickly and the tomatoes will boil with messy results. Once cool test that the lid is held on by a vacuum, unclip wire and lift by the glass lid, it should stay firmly in place. Chilli jam is something I have a real taste for, it goes well with cheese on crackers and in sandwiches. 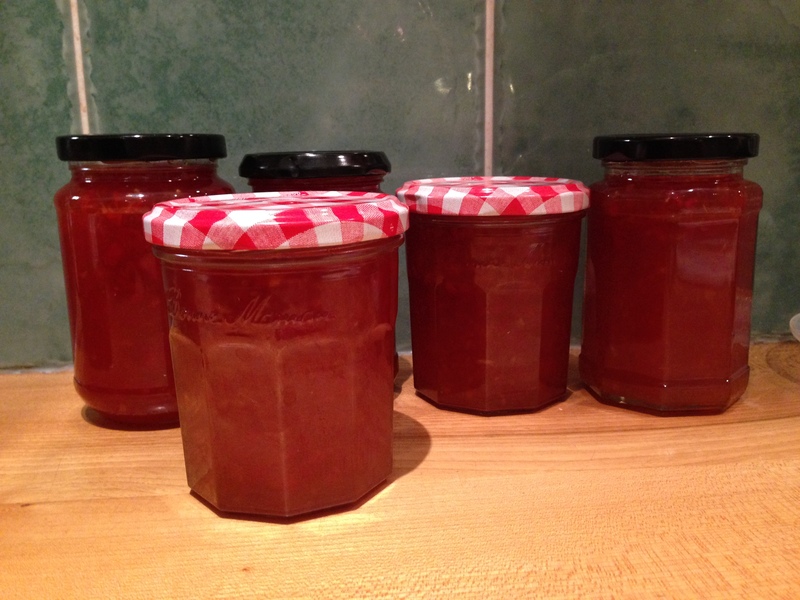 Nigella Lawson has a good recipe based on jam sugar and peppers, but as I have a lot of apples I like to make an apple jelly which then has chilli added. 1.5kg – 2kg apples, chopped and put in a big pan, skins and cores included. Add just enough water to nearly cover the apple and simmer for an hour, mashing a few times to produce a smooth pulp. When this has slightly cooled ladle into a jelly bag over a pan or jug. 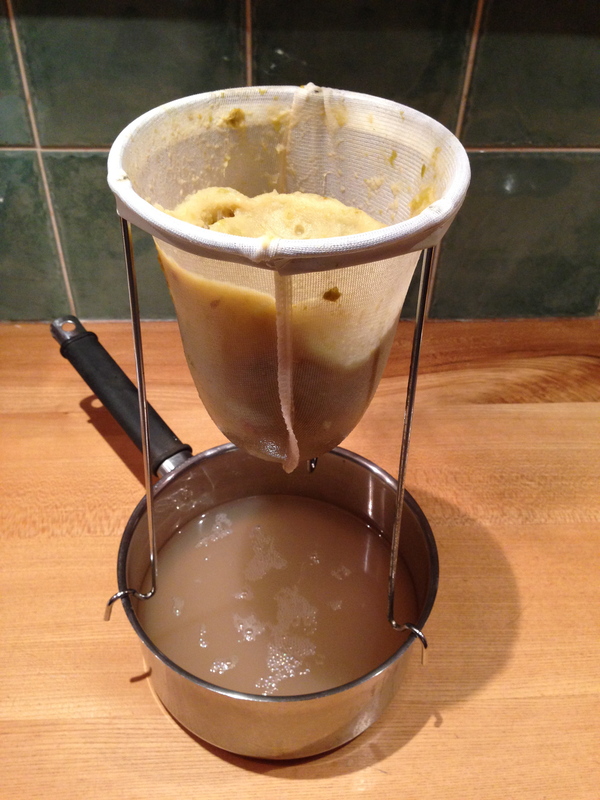 Do not press pulp but allow liquid to gravity drip for several hours, I find this produces a litre of clear apple liquor. If this liquor were to be heated up with 1 kg jam sugar or ordinary sugar plus a sachet of pectin it will set into an apple jelly on cooling, but I want to spice it up. Get 6 or 7 jams jars clean and ready to fill, check lids, dry jars and lids in the oven. Heat up the approximately 1 litre of apple liquor and add finely chopped chillies to taste, simmer for a few minutes to soften chillies. I used 12 fresh Aji Limon chillies and included seeds (about 100g), also a juice of half a lemon, some dried chilli powder can also be added now if desired. Next add the 1 kg sugar plus a sachet of pectin or 1 kg jam sugar. Heat and stir until sugar has dissolved and it is nearly boiling. Turn off heat and allow to cool somewhat before ladling into jars, it is very important that it is not put into jars very hot or all the chopped chilli will rise to the top. After about half an hour off the heat the side of the pan should be comfortable to touch and the jelly just beginning to thicken yet still be easy to pour and ladle, a jam funnel is very helpful or just transfer to a Pyrex jug then pour into jars. Tighten lids. Another variation used the same basic quantities but started by frying in a large pan; 150 grams shallots, 150g red sweet pepper, 150g mixed red chilli (I included some habanero), 3 cloves garlic, 1 tbsp ginger until, all very finely chopped, fry for a few minutes until softened. Then add 2 tsp sesame oil and 2 tbsp fish sauce, and 50 ml wine vinegar. Thereafter as before, to the shallot mixture in the pan add the 1 litre apple liquor and the 1kg sugar plus pectin, heat and jar once semi-cooled. This is a South East Asian inspired concoction, the fish sauce might sound a bit weird but it adds an umami yummyness, and the sweet peppers and shallot thicken and colour the jam nicely. Chillies are always are fairly late to ripen in the Scottish climate even in a greenhouse, many types don’t ripen until October or later, but quite a lot of mine are ready now in early September. As usual I grew too many varieties to give them large pots, so most have been in 3 litre containers. 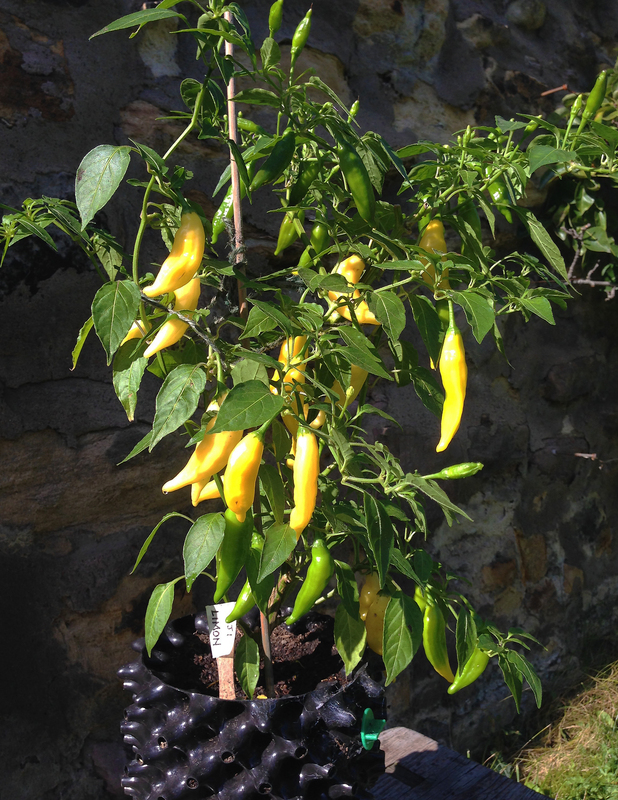 The best performing varieties so far have been Aji Limon, Jamaican Red Hot and Rocato. Aji Limon has very hot pods with a citrus tang and just four pods were sufficient to make several bottles of spicy yellow tomato ketchup with banana. There are dozens more on the plant so a big batch of yellow chilli jam is in the pipeline, if it works well I’ll post the recipe. This year the Aji Limon has been exceptionally good with really big fruit quite early. 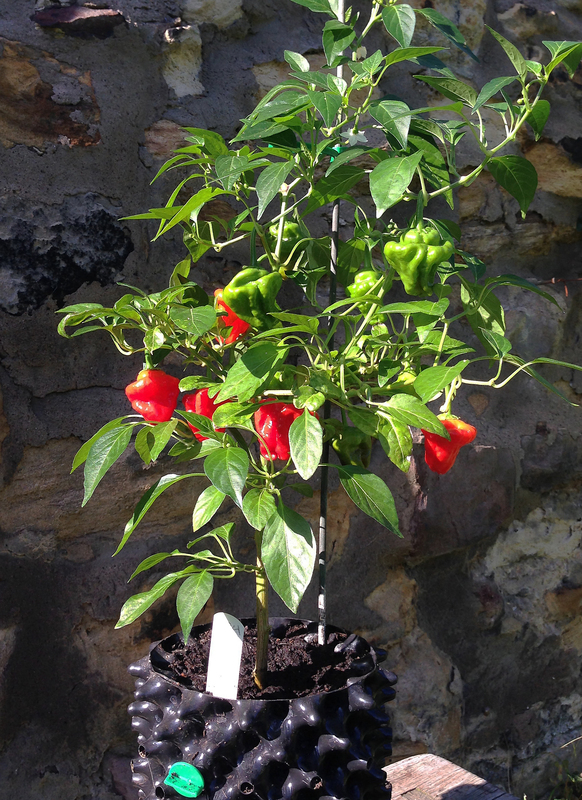 The Jamaican Red Hot has also been early, not quite such a heavy cropper as the Aji Limon but a little goes a long way. 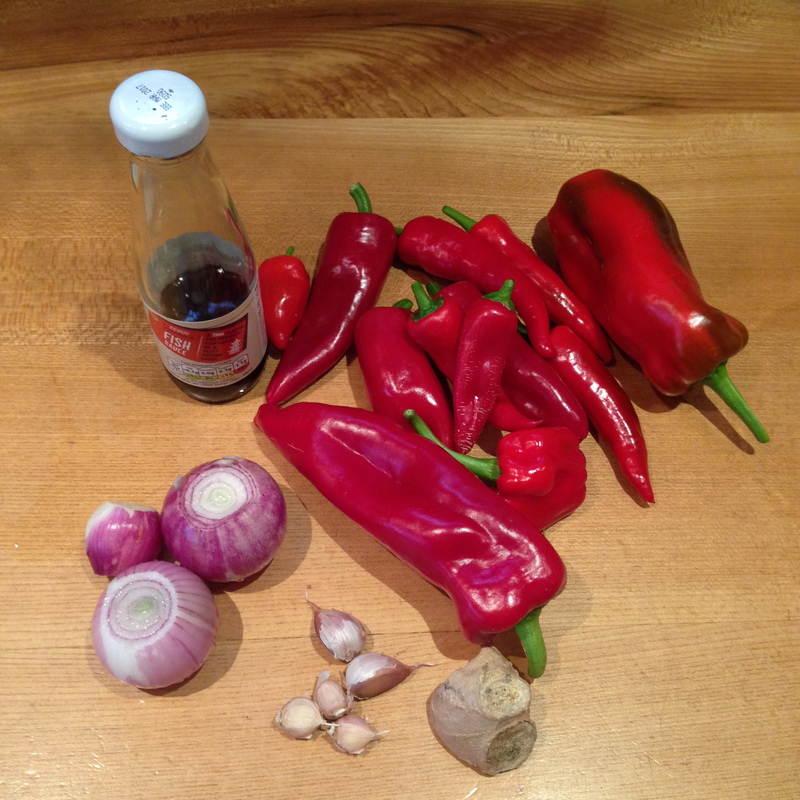 I made a delicious dip with this chilli. Simply roast one with a sweet red pepper and chunks of courgette (I used nearly 1 kg courgette) and some unpeeled garlic cloves tossed in a little oil. After roasting for half an hour or so de-seed the chilli and pepper and peel the blistered skin off if it is very blackened, squeeze the creamy roasted garlic out of the skins, then mix everything together in a blender and season. Mix with some sour cream, scoop up with tortilla chips and enjoy, this is great way to use up courgette if you have a glut. 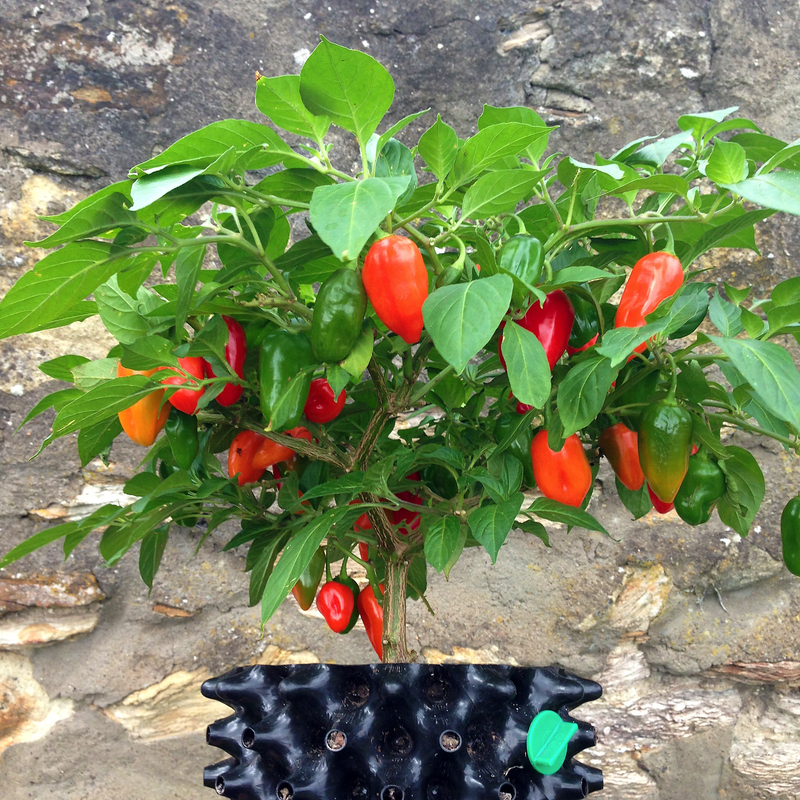 The Rocato chilli is absolutely dripping with lovely looking red pods, a huge number for such a small plant. I have not used any of these yet as I just enjoy looking at it, the foliage is exceptionally healthy looking and I think would be a perfect kitchen window sill plant as it is very attractive and fairly compact. A bit like a spreading bonsai tree but with big red fruit you can eat. 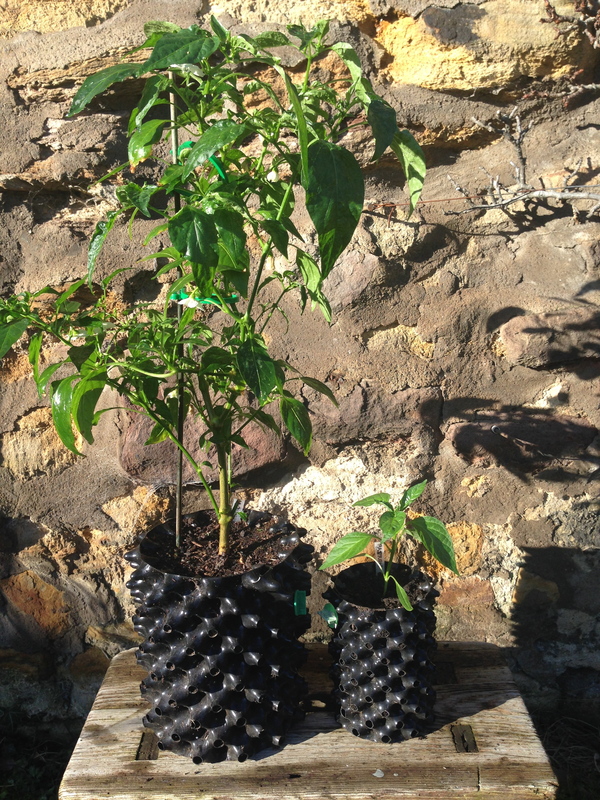 Some chilli plants have remained in one litre pots but even in these little containers they are producing well. Various cayenne types are ripening in these pots, perhaps the most impressive is an unknown type which I know simply as Turkey, because someone sent me seed they had come across while in Turkey. One little plant has about 25 pods, so a couple of these could provide 50 or so, that is about a years supply if you use one a week. It is a thin walled type which should dry easily meaning they would keep well for a long time, hung in a string perhaps. 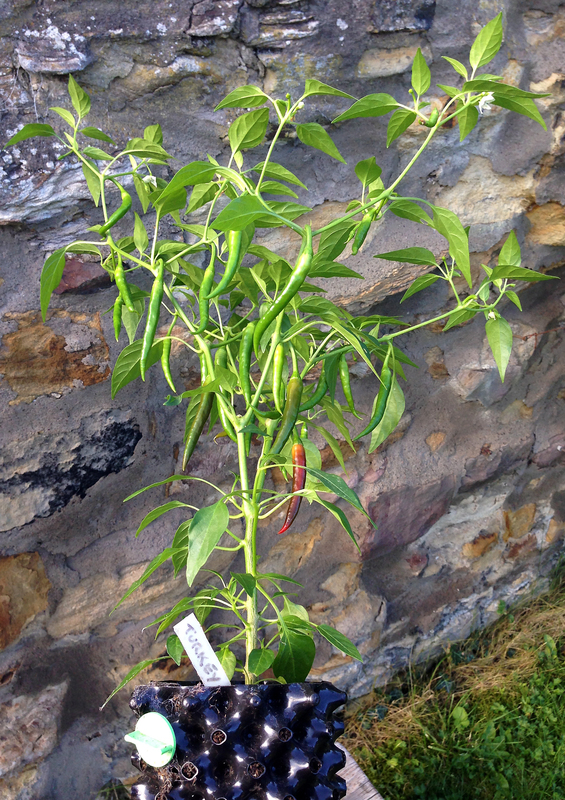 Self-sufficiency in chillies from just a couple of one litre pots is pretty good growing I reckon. The summer sun and warmth mean plants are growing apace and in the greenhouse the tomatoes are roof height. 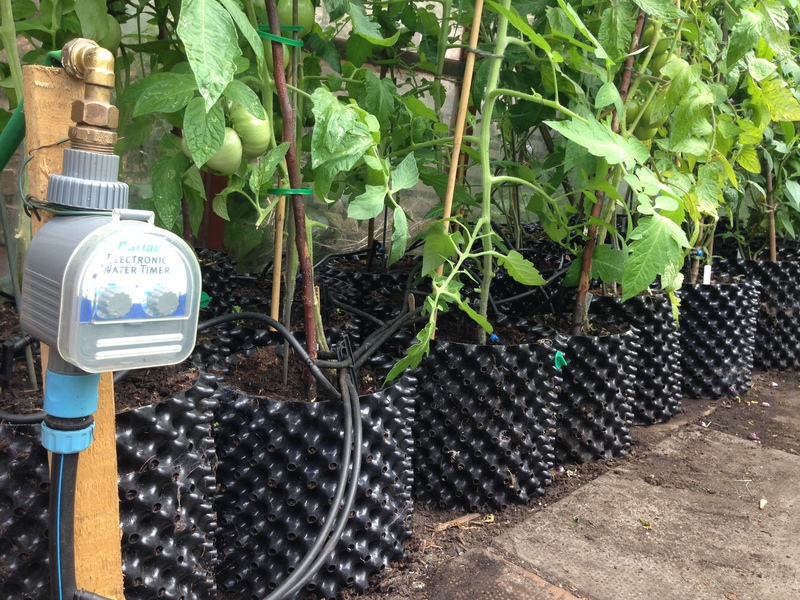 Once again the drip irrigation system, controlled by a timer, is working well and a few main crop tomatoes are ripe already. 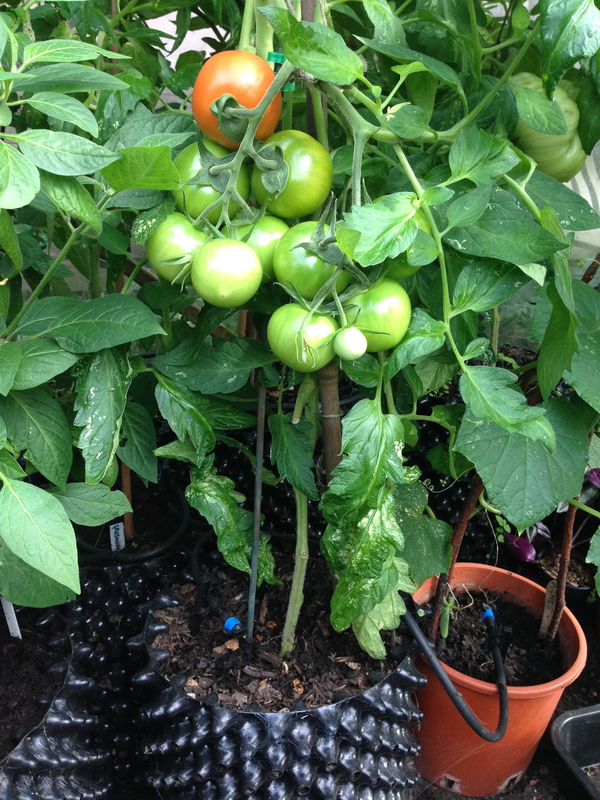 What has proved very worthwhile are the early ripening tomato varieties in medium sized pots (9 litre). Though a bit small for a tomato plant they are quite adequate for smallish varieties, which are yielding around three trusses of super early fruit. Most surprisingly, fruit are ripening even on the plants that were cast out of the greenhouse in June. The earliest were Stupice followed by Bloody Butcher , Sub-Arctic Plenty and Glacier. 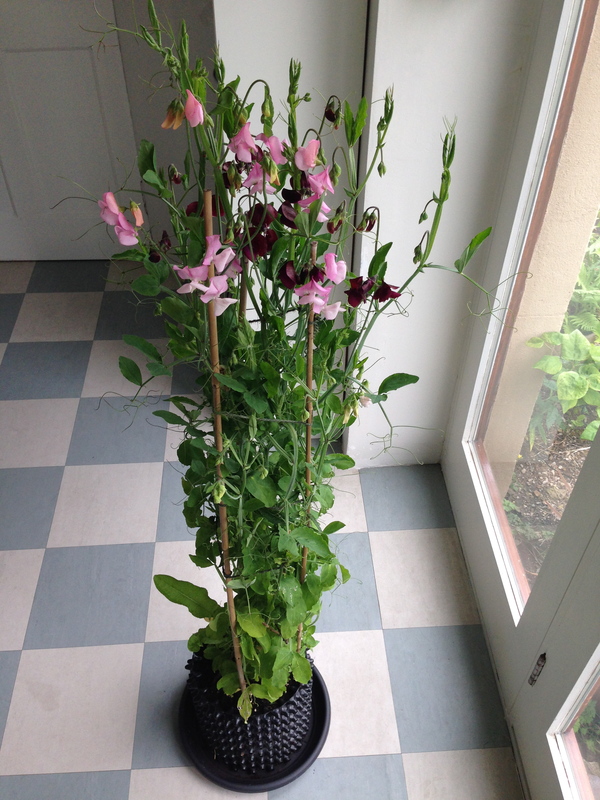 This last variety is actually growing quite tall outside against a wall, with five trusses of fruit forming. 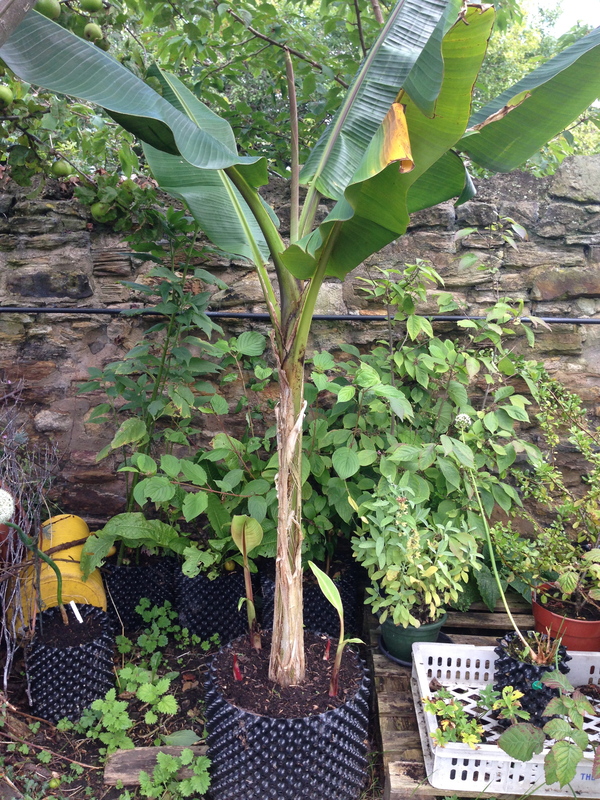 I am incredibly excited by the growth of my banana which was recently moved from a medium to an Extra Large Air-Pot. 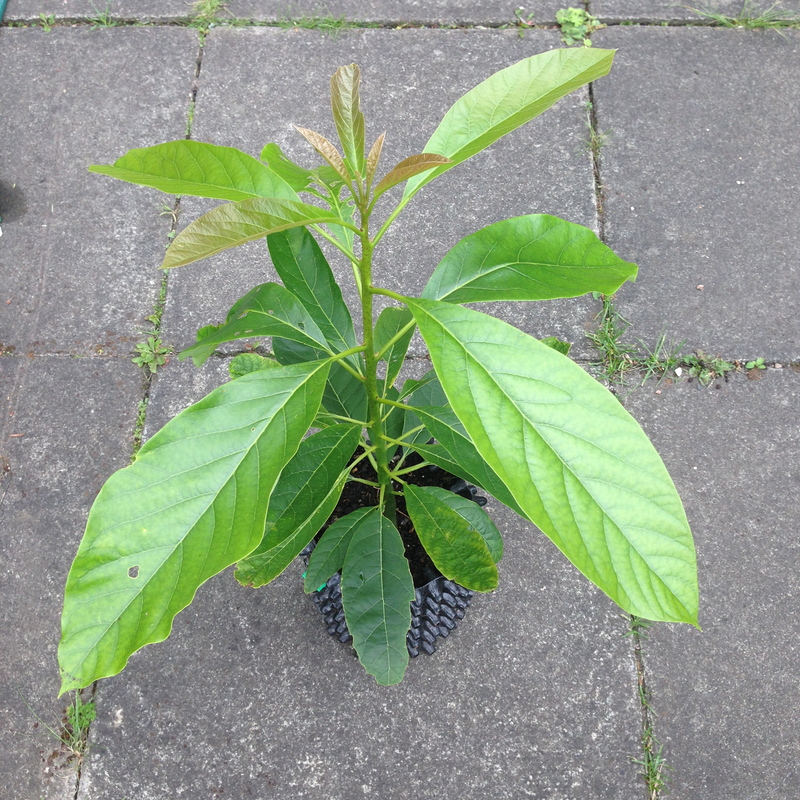 This started the season with one or two leaves but now looks like a proper tree with a real spray of exotic looking foliage, AND pups have formed! 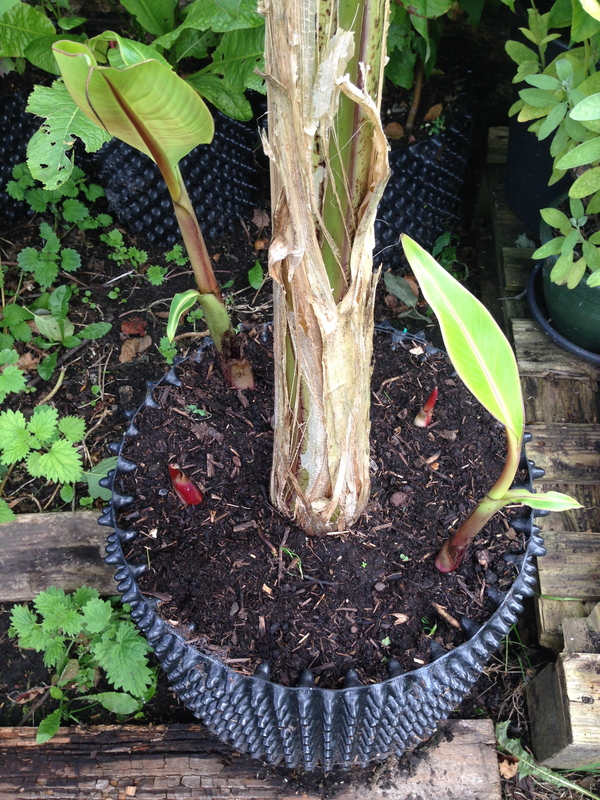 Four little offsets have sprung up around the main truck so this looks set to be a little banana grove in a pot. I’m also rather pleased with my onion in a pot just because it is so perfect. 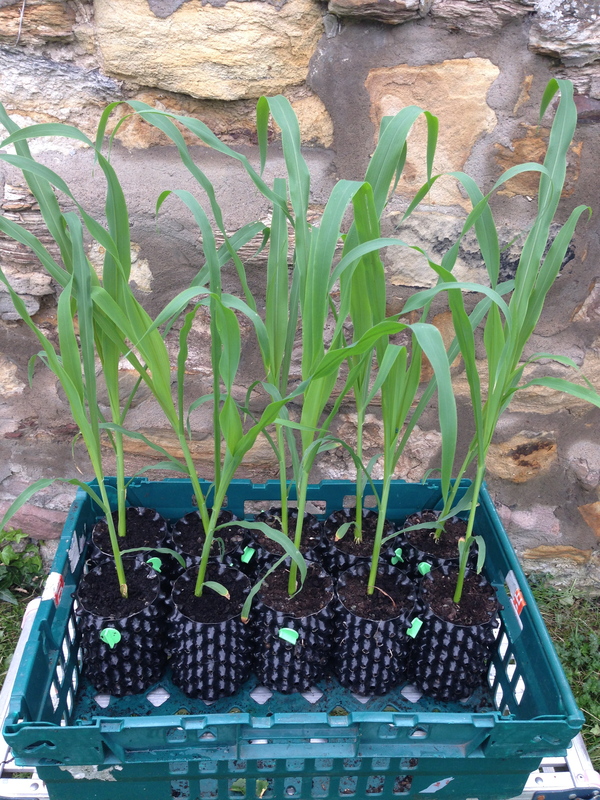 The crops-in-pots are mostly still growing apace but not quite ready to harvest. 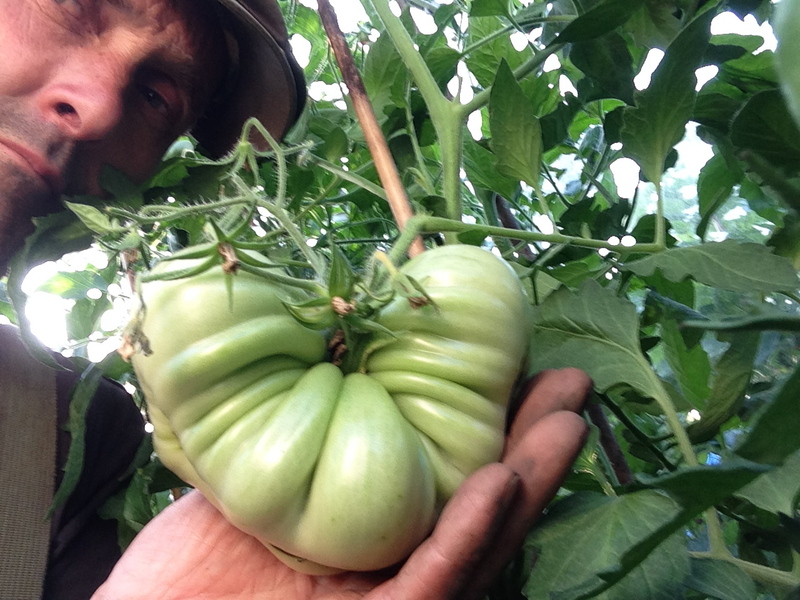 There are plenty of green tomatoes, some of them rather strange shapes, but not many ripe yet. 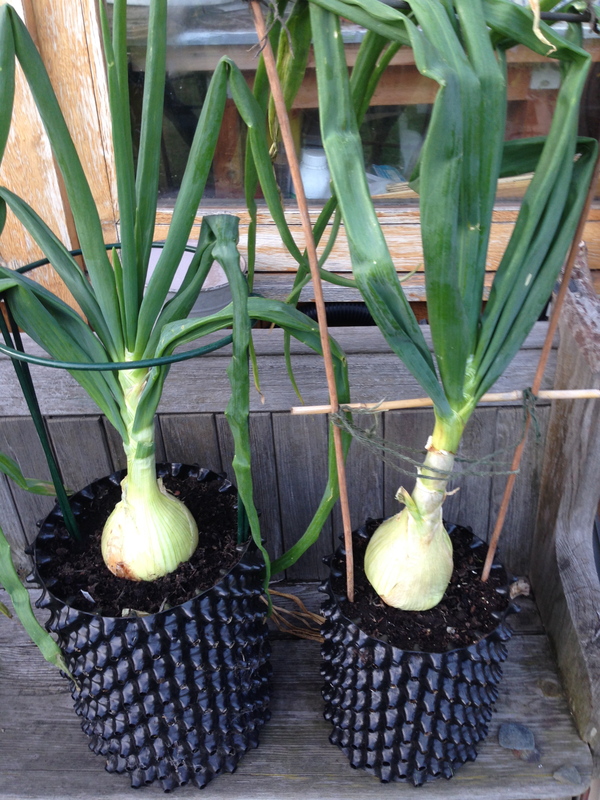 I am pleased with my onions and leeks in Air-Pot containers, they are bigger in these pots than similarly treated plants in the ground. 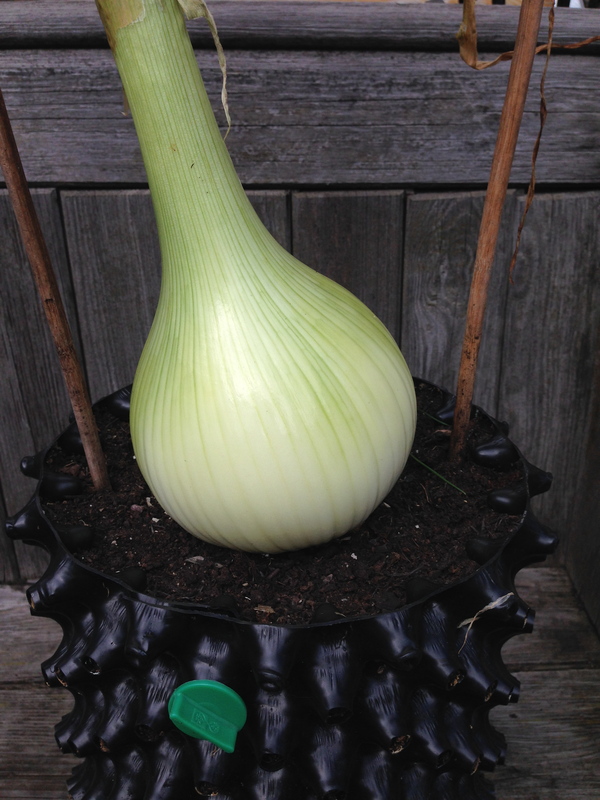 Giant veg growers produce monster Air-Pot grown onions and this year Mark Shepherd is quietly confident of a world record. 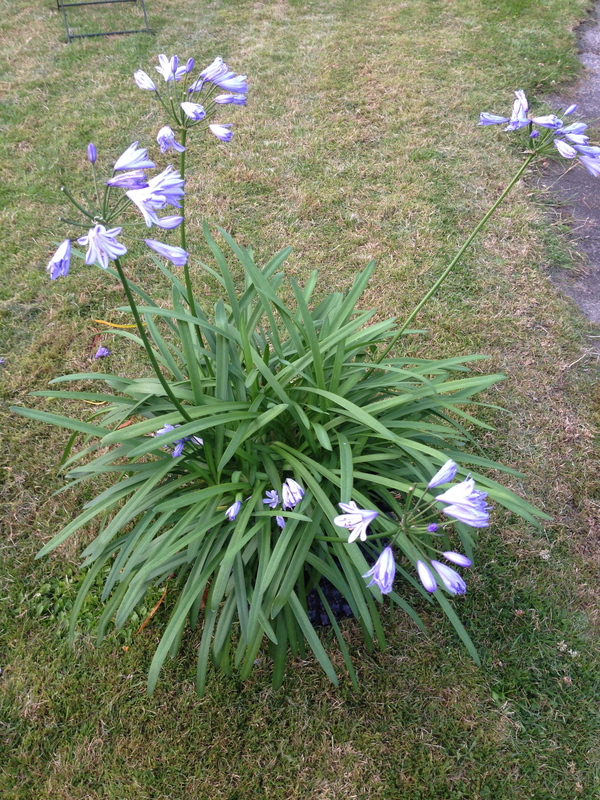 Flowers are being produced in abundance, my agapanthus has filled out nicely and thrown up flower stems for the first time. 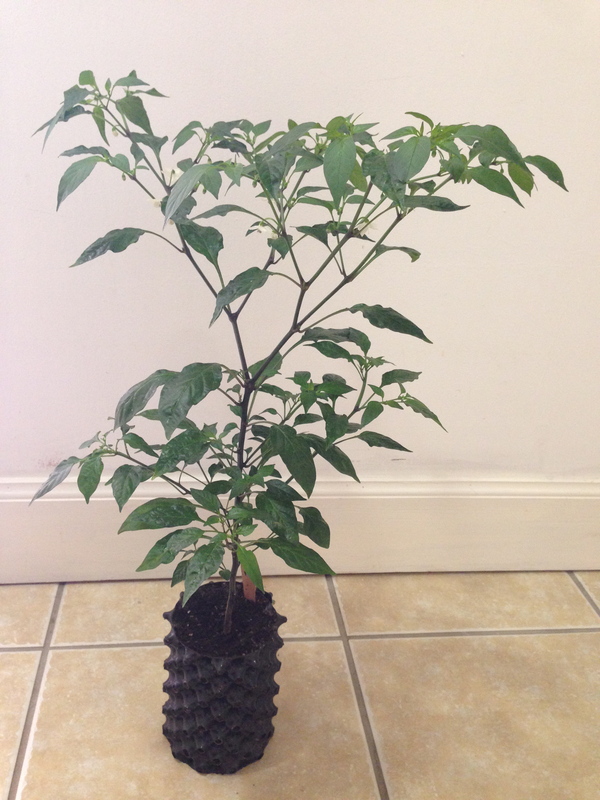 It split its previous pot and seems to be much better now those vigorous roots are air-pruned. 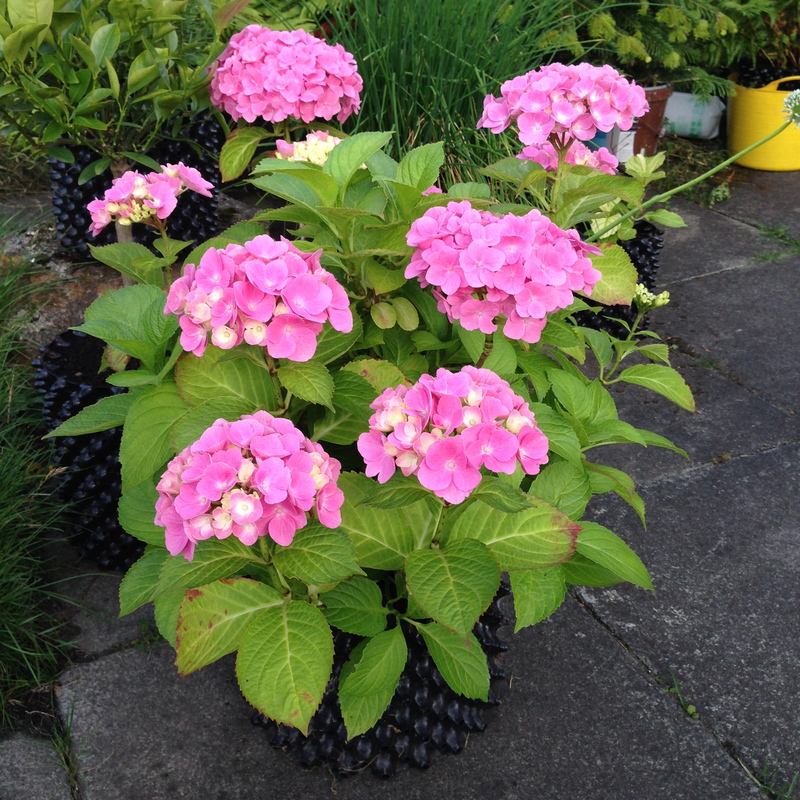 My hydrangeas have put on a good display despite having been in the same rather small pots for three years. One edible that has just started to yield useful crops are the blueberries, and the mixture of varieties should continue to ripen right through August. 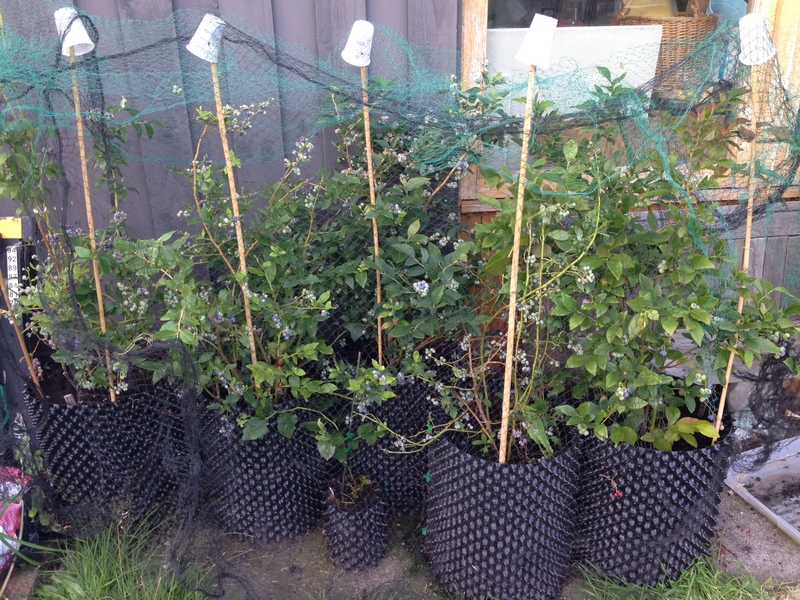 The Air-Pot grown bushes have been in large containers since the beginning of the year and look set to crop very well. For the first time some will have to be preserved. A pair of blackbirds have been helping themselves a bit too freely so nets have had to be deployed.